:Devin McGalmery has the type of soulful distinctive voice which is ideally suited to this eclectic mix of classics such as 'Hold To God's Unchanging Hand' and 'When He Was On The Cross' as well as fresh original songs. This album includes a duet with his wife Karen, ('Waiting At Home') plus collaborations with Beyond The Ashes and, of course, Ernie Haase and Signature Sound. 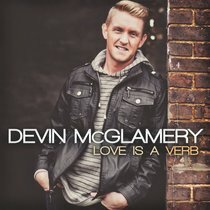 About "Love is a Verb"
Devin McGlamery's background in music spans much deeper than he is old. He joined as lead singer in December 2009. Prior to joining EHSS, he had a five-year stint as lead and tenor for southern gospel's Grammy-nominated Karen Peck & New River. Before KPNR, Devin spent five years with the Dixie Melody Boys, another popular gospel group he started touring with when he was just 17.